If you’ve still got your Galaxy Note 7 and plan to continue carrying it despite the recall, you can no longer bring it aboard an airplane. 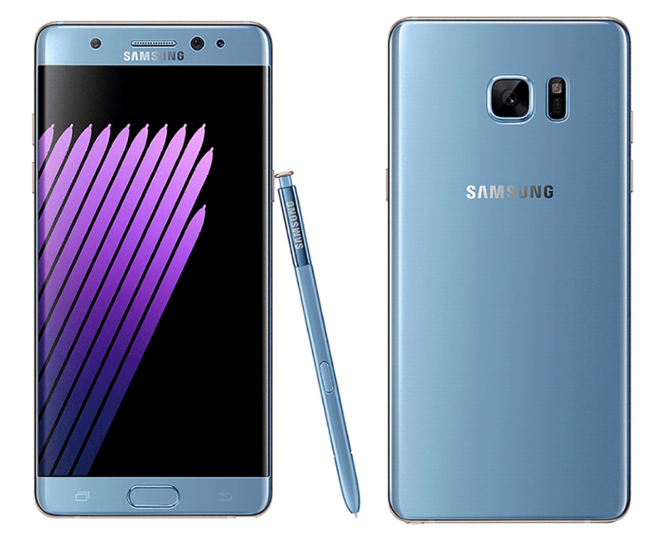 The Department of Transportation (DoT) has officially banned the Galaxy Note 7 from US airplanes. The FAA recently urged Note 7 owners to power down their devices while aboard a plane, but with this official ban, Note 7 owners are not allowed to bring their phones onto a plane at all. The ban will go into effect tomorrow, October 15, at 12:00 pm ET. Earlier this week, Samsung updated its Galaxy Note 7 recall to include original and replacement devices, and it also discontinued production of the Note 7. According to the US Consumer Product Safety Commission, there have been 23 reports of overheating Note 7s since the first recall in mid-September. While Samsung can’t force Note 7 owners to return their devices, it’s going to become more difficult to use one. For example, now that the Note 7 has been recalled and discontinued, it’s unlikely that there will be any software updates, and Samsung has shown that it’ll nag Note 7 owners with notifications to return their phone. Now you’ll be unable to board an airplane with one, making traveling with the Note 7 more difficult. The hits just keep coming. This has become one of the biggest screwups in tech history. This might affect all Samsung phones when DoT employees are not familiar with the Not 7. TSA agents have been briefed on what to look for. It’s a pretty easy phone to spot. The curved glass and the S-Pen give it away. So, just continue on with your /s. TSA isn’t as stupid as you may think. You really really haven’t dealt with them in a full “we know what we are doing” capacity. I deal with TSA 2 to 3 times a month. i guess you are on (UA) United Airlines 3781 – i should call TSA and report you. Yep! Hurry up and call them! Lets see… all they need to do is remove case if necessary and look at the back of the phone. There even a stupid person can find out if its a note 7. At least I would hope are not that stupid that they cant even figure this out. My parents made it onto a plane yesterday without any issues and they have a Galaxy S7 and Galaxy S7 Edge. I was surprised. highly unlikely. TSA will have been informed. Rofl, that would be a first. TMO customer service said official pre-order for LG v20 starts Monday. I wouldn’t expect it to be much lower than the Note 7, especially with at&t charging 830 for it. i’m reserving judgement until i see it in-person. i was hyped about the g5 until i saw the poor fit and finish. i don’t NEED a new phone. my G3 is still going strong. Cool, I’ll get ready to make my purchase. Besides the headphones any other gifts come with the V20? i remember when cigarette lighters were banned. there were piles of lighters in the smoking areas. will there be piles of note 7s? what about people in-transit or not yet on their way home that have to catch a return flight? and when you’re stopped at the checkpoint, and made to surrender your phone what do you plan to do? you’re lying, unless you’re posting from the plane, because all the planes leaving from CWA have left for the day. i posted about you on united’s facebook page. maybe they’ll catch you on the other end. i hope so. Lol I hope they do! And I hope you exert this much energy in reading and trying to advance to a higher level of education rather than just stay at a elementary school level of intelligence! Lol you’re an idiot! wow. you’re the idiot. and a selfish one willing to put peoples’ lives at risk. i think you’re trolling. post a pic of your boarding pass. Why risk everyone’s life because of your s*** phone? Get over it. Leave it at home. No one wants they’re security clearance delayed because you want to rebel. I’m not at home genius… I’m still out of town on business.. Backup your data to the internet or SD card and save you SD card just in case. At least go early to the airport with a low charge, maybe if you drain your battery completely… who knows. Go early and talk to them. On the other hand the fine is too high to even try it. Difficult choices. The ban, which is a response to continued threats of the smartphone’s battery exploding, covers not only U.S commercial flights but also cargo planes. The U.S. Department of Transportation and the Federal Aviation Administration stated that anyone who tries to travel with a Galaxy Note 7, or tries to pack it in checked luggage, will have the phone confiscated. Those folks could also face fines for violating the ban, along with possible criminal prosecution. It would be worth your time to drop by a tmobile store and spend the 1 – 2 hours getting a replacement. Crap! where are you at? if there’s an airport nearby i’m sure there’s a tmobile store. i just did. you’re even more screwed. tiny airport with bored, gun-ho TSA people. it’s not like they are just going to say “OK, i’ll risk my job for you”. the fine, if caught with one on a plane is $180,000 btw. better make a roadtrip to madison (2 hours each way). have you even called tmo for suggestions? as for educating myself, why haven’t you exchanged it already since you are wont to flying into bumfuck? the last one caught on fire, on a plane, 10 days ago. you really should have seen this coming. Exactly… So once I get home that’s what I’ll do… I see your not that smart are you? Can you make it to green bay, oshkosh, appleton, or eau claire? There is a store in each one. If I could I would but that’s to far away from me. My job is not going to pay for another companies mistake. That’s not how any of this works. no, mainly BS. you knew about this long before it became a real problem. man-up. take responsibility. my point? you’re a selfish, uncaring idiot willing to put others at risk. This is the best comment on this Blog. Smart decision on FAA’s part. As someone who flies often, I don’t want to have to deal with the possibility of delayed/canceled flights or emergency landings resulting from this phone’s battery venting in flight. With that being said, I wonder how the TSA will handle the issue with Note 7 owners who traveled away from home before the ban went into effect. no excuse. you knew about this 11 days ago. stop playing the victim card. You’re an idiot lol if I’m out town then I’m out of town. No victim here, and am not claiming to be. no excuses. you’ve had ample time to get rid of your pocket bomb. way of smuggling the phone. the agency from liability claims should something go south. In other words, I’d feel much safer even if all 300 passengers and crew on board had note7 in hand, than a single device hidden somewhere in the luggage (which the way this ban is implemented might unintentionally contribute). wow. would you feel the same way with your family onboard? Did you bother to read the whole post…? yes, i did. you’re arguing both sides. all checked bags are x-rayed, btw. That’s the whole point.. the end result is true for anyone: me, members of my family, you or anyone else for that matter. X-ray cannot differentiate Note7 from any other phone in the bag, and I highly doubt TSA is going to manually check every time they detect a phone in the luggage (since it’s not illegal to have any other phone in the luggage, except for a recalled model). The major risk of note7 is that it can spontaneously ignite causing a fire, not that it could explode and blow up the plane (regardless of what media wants you to think). And that risk exponentially increases when the phone is left unattended (somewhere in the luggage for example). While having a phone in a plain sight poses minimal risk. After all it has capacity of around 3 aa batteries. too long. didn’t read it all, but i do think they will search any suspect bags – electronic things connected to batteries. that was my point. what type of lock you have won’t make any difference. anything with a battery/electronic will likely be searched. they are supposed to leave a note, but it has been my experience they don’t. i’ve had tsa friendly locks tripped, but no note. nothing in the bag that would have been suspicious, either. I’m not posting my boarding pass on the Internet, they do contain sensitive information I’d like to keep private. I have no reason to troll anyone. The tsa is not checking for different types of phones… They have terrorists and real bombs to try and detect. Get over yourself and this topic already. I said I would report back and I did. I’m just saying I see what goes on more often than most people and tsa’s aren’t looking for these phones like people think they are… IO wasn’t trying to win anything or upstage you. Sorry if I implied that. All this negative publicity has to be great news for Apple and LG. Normally LG wouldn’t even get a second blink but this year they are bound to reap the benefits of Sammy’s damaged brand. Airport in Taiwan security checked all cell phones (at least on 10/19) to make sure they weren’t Note 7. Day before,Yangon Airport had signs at check in counter – “No Note 7”.